Today about 400 were injured after a meteor exploded over Chelyabinsk in central Russia. The blast happened at an altitude of 10,000 metres with the meteor breaking apart and causing a shower as it entered the Earth’s atmosphere at around 9:20 in the morning local time, seen 200 kilometres away in Russia’s fourth-largest city, Yekaterinburg. Early tomorrow morning (2am Malaysian time), an asteroid will race past the Earth on Friday at a distance of just 27,729 kilometers. 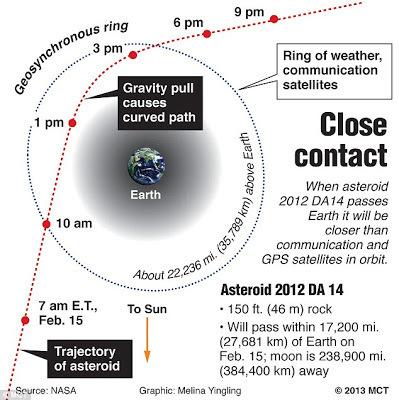 Called 2012 DA14, the asteroid is 50 metres across and while it while miss earth, there is a possibility satellite phone and TV as well as weather satellites will be affected. Go outside and see if you can spot it!